The analyst team offers a variety of products aimed at addressing all your security, risk, and intelligence needs. Le Beck aims to use data to bolster our expert analysis in order to provide you with a fact-based picture of what already happened and what might occur next. Plus at some of the most competitive prices out there, with packages specifically designed for embassies, NGOs, regional and country security managers, and corporate entities. 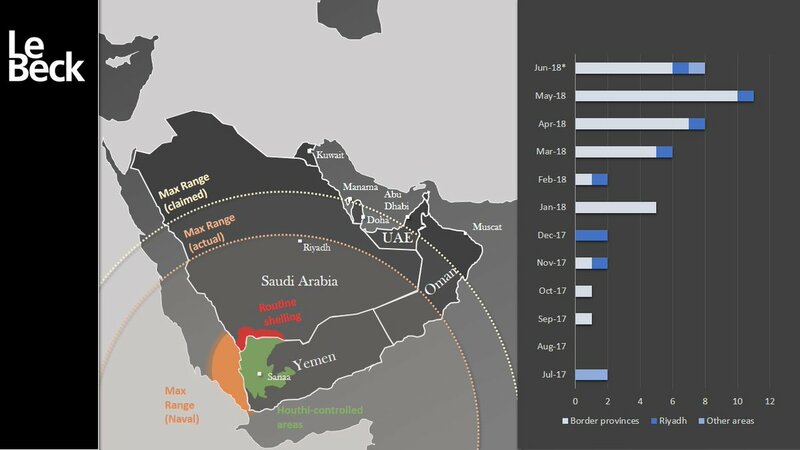 We offer a free Daily Security Brief that covers regional security trends alongside concise analysis, and which is intended to complement our competitively-priced in-depth Weekly Security Brief that provides a deep dive into more strategic issues. Added to these are our Interactive Incident Maps that cover the events of a specific country, comprehensive Country Threat Assessments (CTA), and custom analyses designed for you. 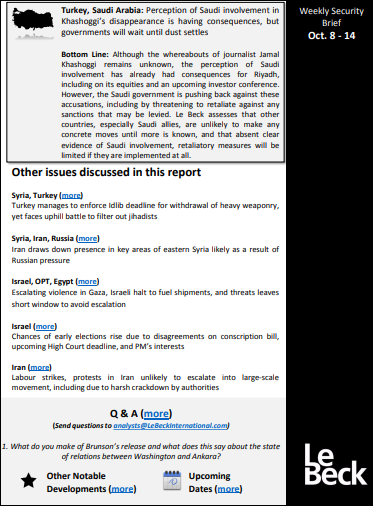 Stay apprised of the main security trends in the Middle East and North Africa with a daily brief complete with clear-cut bottom-line assessments focusing on the “so what?” Le Beck’s goal is to deliver concise and street-smart overviews and analysis that can be read by professionals across the region in five minutes or less while travelling to work. Review a sample here and sign up to receive our brief here. To complement our daily newsletter, Le Beck offers a weekly brief sent each Monday that provides in-depth coverage of key strategic issues affecting the Middle East and North Africa. Our analysts choose the most pressing issues and then delve into them, analysing what is occurring and our predictions as to what might happen next. Included as part of our packages, Le Beck’s “on-the-spot” analyses are released during major crises to discuss, in a timely manner, the context and potential consequences of transformative events and guide decision-making. Our CTAs provide a comprehensive overview of threats and considerations necessary for operating in the country at hand. It addresses all key topics and assigns each a threat level, including crime, political and fiscal risk and stability, as well as any potential issues related to health, the environment, and culture. Le Beck offers custom analyses and reports on a range of countries and topics that are built by you and for you alongside our team of experienced analysts. Like all of our reports, we use data to bolster analysis, specifically addressing the issues you care about, in the countries of your interest, whenever you need it. Samples and extracts can be viewed here. Please click here to view our list of package options and pricing.